FRANCIS BEAVMONT AND IOHN FLETCHER Gentlemen. Never printed before, And now published by the Authours Originall Copies. LONDON, Printed for Humphrey Robinson, at the three Pidgeons, and for Humphrey Moseley at the Princes Armes in St Pauls Church-yard. 1647. 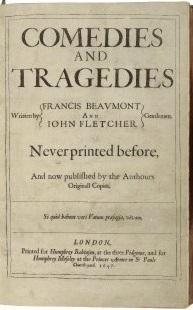 Published as part of Comedies and Tragedies written by Francis Beaumont and John Fletcher, containing: The Masque of the Inner Temple and Gray's Inn; The Mad Lover; The Spanish Curate; The Little French Lawyer; The Custom of the Country; The Noble Gentleman; The Captain; Beggars' Bush; The Coxcomb; The False One; The Chances; The Loyal Subject; The Laws of Candy; The Wandering Lovers (The Lovers' Progress) (Cleander); The Island Princess; The Humorous Lieutenant (Generous Enemies, Demetrius and Enanthe) (The Noble Enemy); The Nice Valor, or The Passionate Madman; The Maid in the Mill; The Prophetess; Bonduca; The Sea Voyage; The Double Marriage; The Pilgrim; The Knight of Malta; The Woman's Prize, or The Tamer Tamed; Love's Cure, or The Martial Maid; The Honest Man's Fortune; The Queen of Corinth; Women Pleased; A Wife for a Month; Wit at Several Weapons; Valentinian; The Fair Maid of the Inn; Love's Pilgrimage; Four Plays, or Moral Representations, in One. Title page imaged from Folger call number: B1581. Image is not from the transcribed copy.